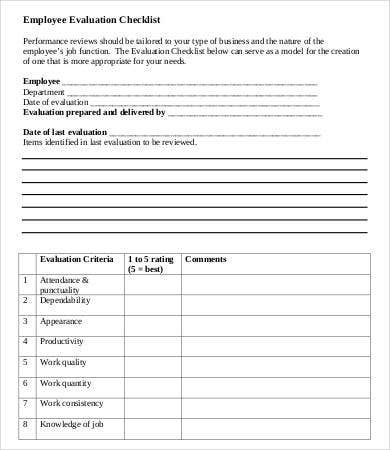 Employee evaluations are done by companies to assess how their employees are getting used to the daily operations of the business and how it can affect their functions in terms of the job responsibilities that they are expected to do.These employee evaluations may be done by the HR (you may take a look at our HR evaluation forms for samples), the supervisor of the employee, or the employee himself. 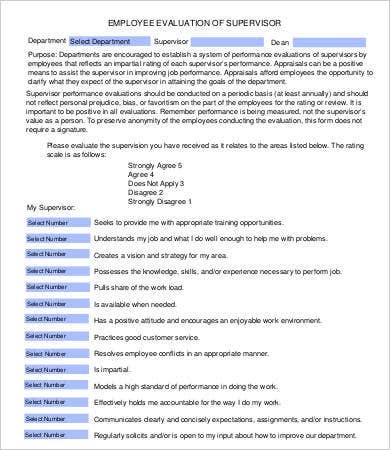 Having employee evaluations help the company know the actions that they need to do to improve the processes of the company in terms of its workforce. 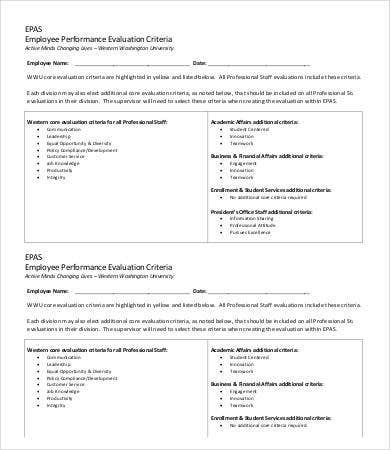 Employee evaluation must be as objective as possible. Be it done monthly, annually, or no matter how long of a period of time, it must not be affected by personal conflicts and other unprofessional matters. 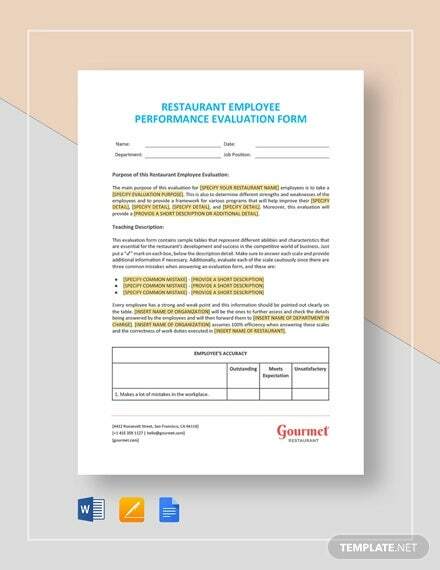 Employee evaluation must solely depend on the performance of a certain employee and how it is affecting both the work processes and the other people involved in it. 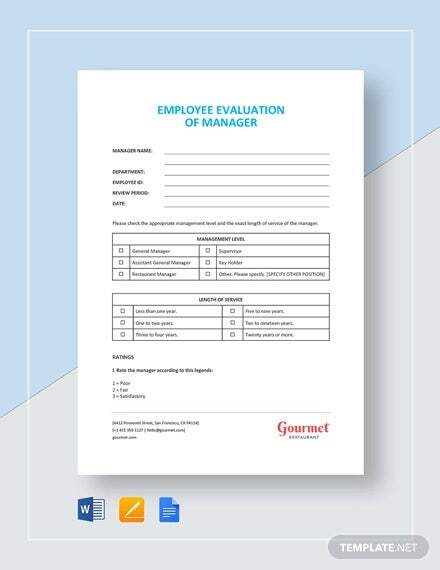 Here are a few sample of employee evaluation forms our website also offers. 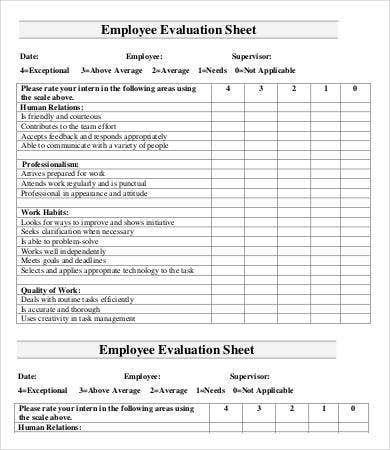 Here are a few more employee evaluation forms templates our website also offer if you couldn’t find the ones your situation needs here. 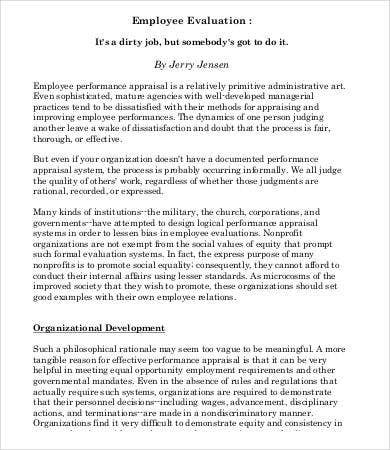 The performance of the employees are ranked in different ways. 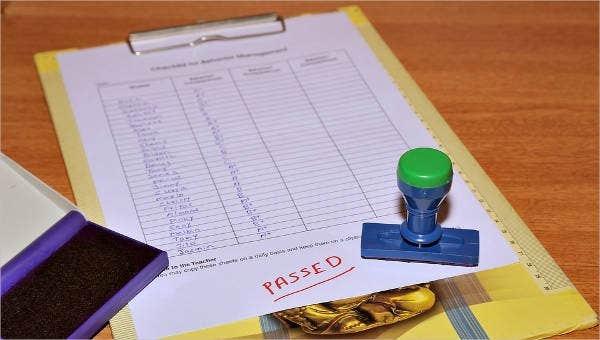 It may either be through a ranking system to know specific levels on how a person has been doing as an employee for the company, getting references from events that have happened during hours of operations, or recommendations and suggestions from the supervisor of the person being evaluated. 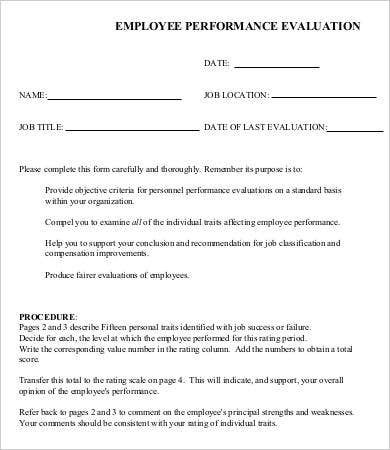 We also offer a few more samples of performance evaluation forms for more references. A chance to personally know someone’s strengths and weaknesses. 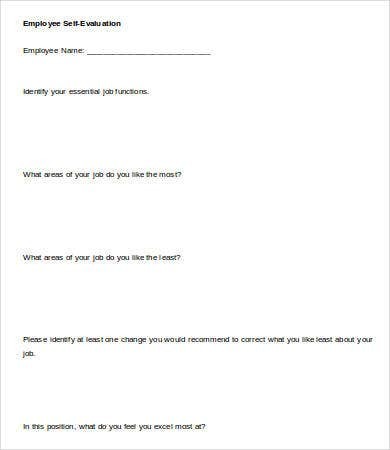 Being able to answer questions about your job performance can help an employee to know the areas where he or she is good at and the areas where he or she can improve. Also, sorting the job functions and discussing them in a more concise and elaborate manner will help identify points that are needed to be taken cared of. 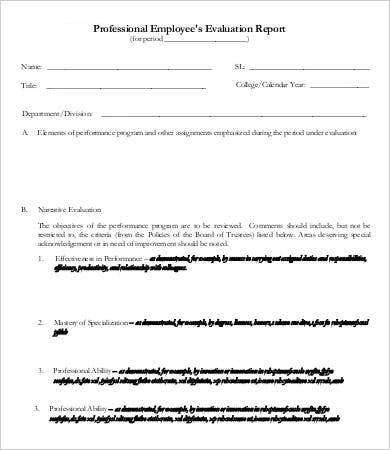 This can be done especially for self-evaluations or if your supervisor gives you a few comments about the evaluation that he or she has given to you. Recommendation for promotion. Getting promoted at the same company needs a good working track record. 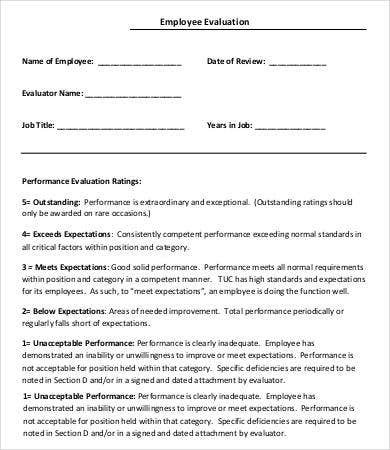 This can only be shown if your employee evaluation for the past duration of time are exemplary. 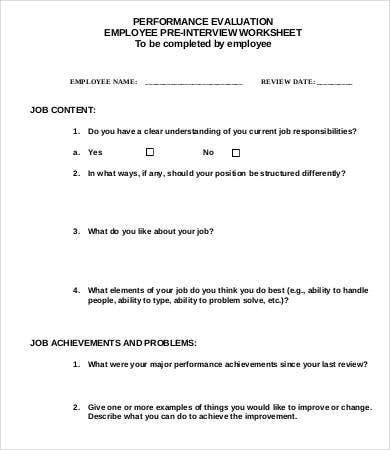 Reference for a new job opportunity should you resign the company. Remember that your new job will get references from the past works that you have done. Your experiences are highly considered, but being able to know the relationship that you have with your past employer can show how you will work to a new company. So always make sure that you are always performing on your best for you to be ready for evaluation any time of the day.